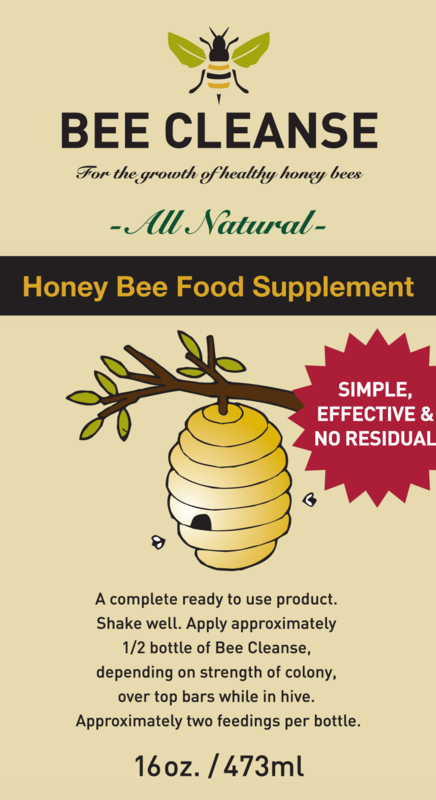 Complete Bee - "All Natural - All The Time"
Bee Cleanse - All Natural honey Bee Food Supplement. A balanced diet rich in floral diversity is essential to the health and well being of your honey bees. Unfortunately, that is rarely the case in today's environment. Bee Cleanse provides a complete, balanced source of nutrients. Honey Bees respond much better to prevention rather then chemical treatment of disease. That is where Bee Cleanse comes in. Bee Cleanse Contains: A Complete proprietary blend of Whole Plant Polyphenols, Complex Essential Oils, Complete Amino Acids, Vitamins, Minerals, Herbals Extracts, Phytonutrient Concentrates and Enzymes in a ready to use product. A concentrated form is also available for commercial operations. This unique formula is balanced, complete, and whole! Contains no GMO, artificial colouring, chemicals, or added animal derivatives. This product exceeds all known organic standards. 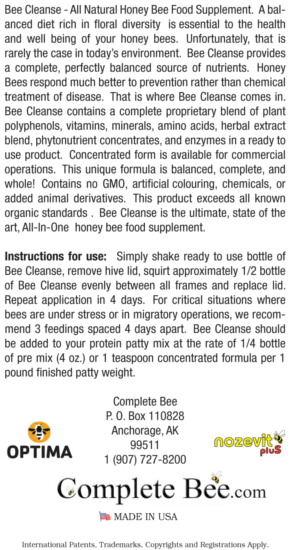 Bee Cleanse is the ultimate State of the Art, "All-In-One" honey bee food supplement. ALSO AVAILABLE AT YOUR LOCAL BEEKEEPING STORE!